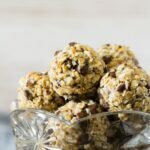 No-Bake Peanut Butter Coconut Energy Bites – Deliciously creamy and fudgy energy bites bursting with peanut butter flavour, and loaded with chocolate chips. A healthy protein-packed breakfast or snack! Today’s recipe is a little healthier than my usual ones, but is in no way less delicious. 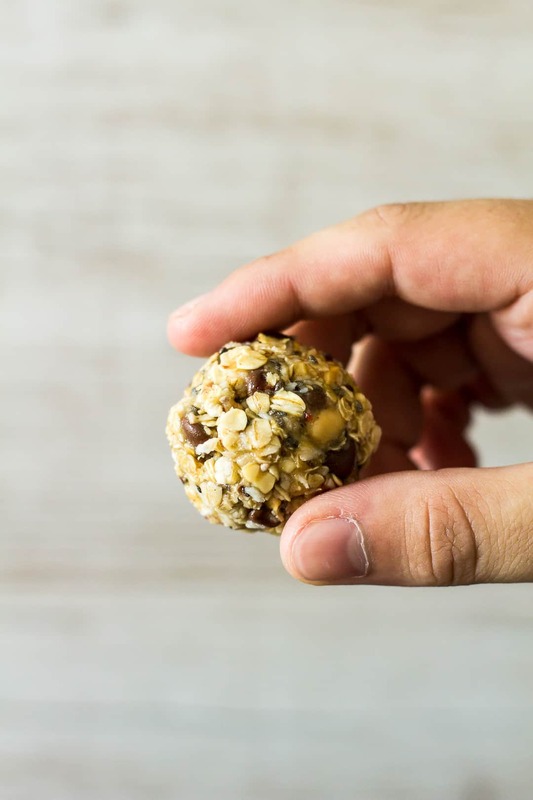 I bring you my protein-packed No-Bake Peanut Butter Coconut Energy Bites. 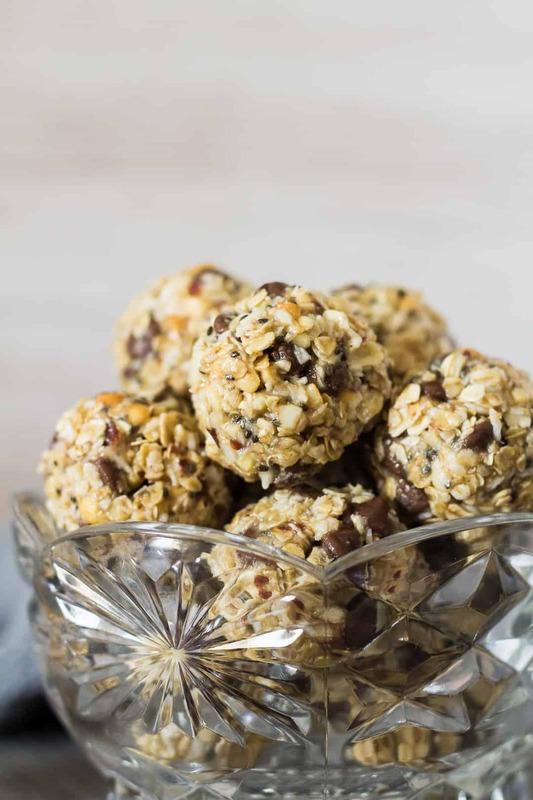 These little snacks are loaded with peanut butter and coconut flavour, and are studded with chocolate chips – they taste absolutely incredible, and are very moreish! Crunchy peanut butter: You can use smooth if that’s what you prefer. Honey, maple syrup, or agave: I used agave for this recipe. Chocolate chips: You can use milk, dark, or semi-sweet. Simply grab a large mixing bowl, and combine all of the ingredients together. The mixture may be too crumbly to roll into balls at this point, so refrigerate until firm enough. Once firm, roll the mixture into 1oz balls. Keep refrigerated until ready to eat! Peanut butter: Filled with healthy fats and fibre. One serving (2 tablespoons) of peanut butter contains 8g of protein! Perfect for a quick energy boost, and will also keep you full for longer. My favourite peanut butter is Whole Earth Organic Peanut Butter. Desiccated/shredded coconut: Full of healthy fats, fibre, and protein. One cup (80g) of desiccated coconut contains 7g of fibre, and 2g of protein. Chia seeds: Just one ounce (2 tablespoons) of chia seeds contains 4g of protein, 10g of fibre, plus vitamins and minerals! Rolled oats: Rich in fibre, protein, and nutrients. 100g of oats will get you 10g of fibre, and 13g of protein. 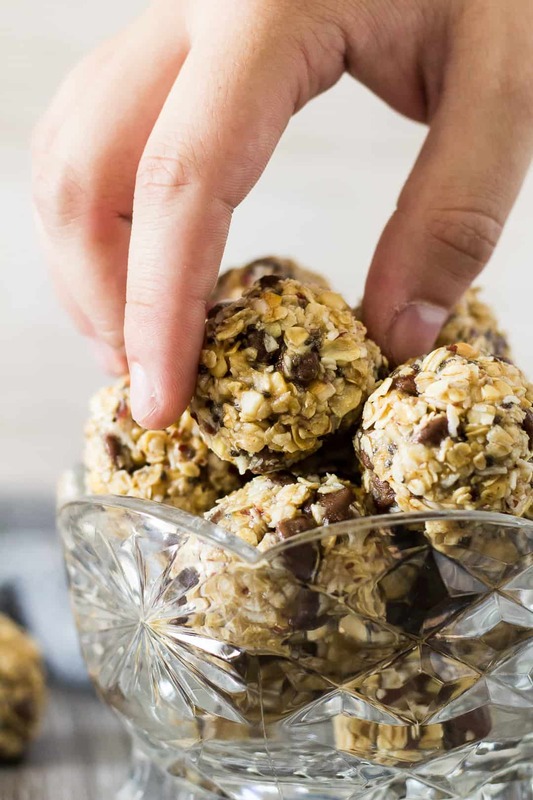 These no-bake snacks are perfect for when you’re on the go, or just need a quick, healthy energy boost. When you’re not devouring these energy bites, they will keep fresh in an airtight container in the fridge for up to 2 weeks. You can also freeze them for up to 3 months. Try these peanut butter treats next! 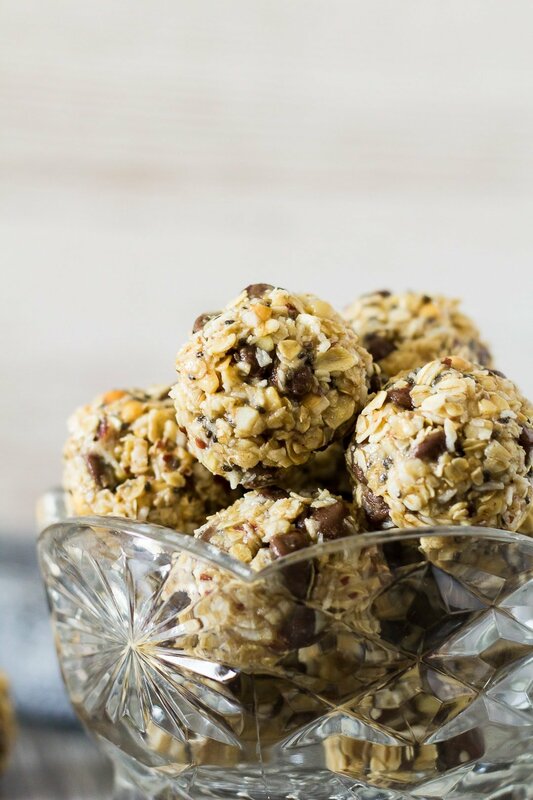 Deliciously creamy and fudgy energy bites bursting with peanut butter flavour, and loaded with chocolate chips. A healthy protein-packed breakfast or snack! 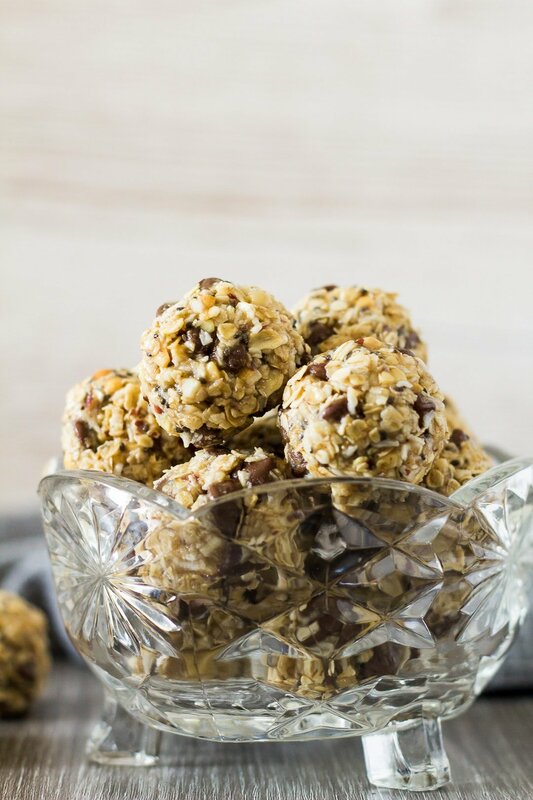 In a large mixing bowl, mix together the oats, peanut butter, honey, vanilla, coconut, chia seeds, and chocolate chips until completely combined. Refrigerate the mixture until firm enough to roll into balls. Roll the dough into 1oz balls. Refrigerate or freeze until firm, then serve, or keep them refrigerated in an airtight container for up to 2 weeks. They also freeze well for up to 3 months. Thaw overnight in the fridge before eating. The nutritional facts are an estimate only. Love these with sunflower seed butter too! A delicious afternoon snack! The only thing better than chocolate + peanut butter is chocolate, peanut butter, + Coconut!! These are so perfect for a snack!